Always consult your vehicle owner’s manual as well as tire manufacturer's literature for specific information as to vehicle/tire performance. The intent of Discount Tire Direct is to supplement and not supersede this material. In the event of a conflict in the materials, you should always rely upon the recommendations of your vehicle and tire manufacturers. At Discount Tire Direct, our first consideration is the safety of our Customers. When it comes to driving your vehicle, there are several variables that can affect your safety. Road conditions, adverse weather and driving behaviors are a few that can compromise your overall safety, but your tires also play a role. Of all the safety features on your vehicle such as anti-lock brakes, traction control, and all-wheel drive systems, your tires are one of the most important. Your tires are the only thing that connect your vehicle to the road, so it makes sense that they play such a major role in your safety on the road. Before you hit the road, it is important that your tires are properly maintained and are in good working condition. The more you know and understand about your tire’s health, the better off you will be when driving your vehicle. There are 4 main factors when it comes to the health of your tires: Tread Depth, Tire Age, Tire Inflation/Load, and keeping up with Routine Maintenance. Tread depth refers to the amount of tread remaining on a tire. This is calculated by measuring the distance between the top of the tread block to the bottom of the tread void. This number is normally displayed in 32nds of an inch, but can also be measured in millimeters. The amount of tread remaining on a tire impacts handling, traction, and stopping distance. As a tire wears and the tread depth is reduced, these characteristics begin to diminish. This effect is amplified when driving in adverse conditions such as wet or slick roads. As you can see on the stopping distance chart, tread depth effects how well your vehicle can stop, especially on wet roads. It is very important to be aware of how much remaining tread is on all of your tires and how it impacts you. In 2012, the National Highway Traffic Safety Administration (NHTSA) released a study directly correlating low tread depth with an increased likelihood of being involved in an accident. Industry standards recommend replacing a tire worn down to 4/32” and below, and does not recommend servicing a tire worn to 2/32” and below. *The Michelin Premier tire line does not follow the stopping distance portion of the above image as it contains technology that allows it to perform like a new tire all the way down to 2/32nds. The age of your tires is another important consideration when it comes to your tire’s safety. When it comes to tire aging, it is very simple: the older the tires are, the higher the risk for failure. A publication from the American Chemical Society: Rubber Division, released in 2008, states how an aged tire has reduced crack growth resistance, which can lead to an increased rate of tire failure. Tires are made of rubber, which over time begins to break down. As a tire ages, oxygen penetrates the rubber causing the rubber to start breaking down on a molecular level. The rubber begins to become harder and more brittle, losing its elasticity and strength. After a point, the tire’s ability to carry weight is reduced and it could potentially fail. Even if a tire has never been put into service or has very little use, it has still been exposed to time and elements causing its integrity to be compromised. The age of your tire can be determined by the DOT number stamped on the sidewall of every tire produced for street use. NHTSA has conducted studies on tire aging and released findings showing a link between tire aging and the increased chances of tire failure. 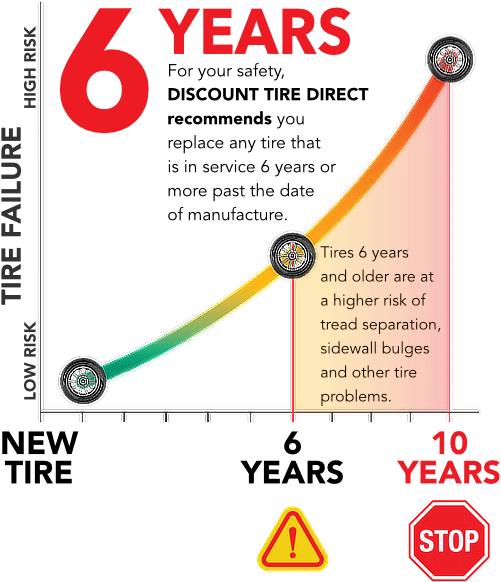 Most tire and automobile manufacturers recommend replacing your tires between 6 and 10 years. We recommend replacing any tire that is 6 years or more past the date of manufacture, and will not service tires that are 10 years or more past the date of manufacture. A properly inflated tire is equally important when it comes to tire safety. As documented by The Rubber Manufacturer Association (RMA) and NHTSA, an under-inflated tire increases the chance of tire failure. A tire must be able to hold the weight of not only the vehicle, but also any additional load the vehicle might be carrying such as fuel, passengers, and payload. A tire alone does not have the strength to support this. As air pressure builds inside the tire, the sidewalls gain strength and with the proper air pressure, it can now support the vehicle safely. An under-inflated tire lacks the ability to support the vehicle and quickly becomes compromised. The Rubber Manufacturers Association (RMA) released a publication showing that driving on an under-inflated tire will begin to generate excess heat causing the rubber to break down. Eventually the tire will no longer be able to withstand the excess load and fail. It is very important that you check your air pressure often to prevent driving on under-inflated tires. All vehicles from 2008 to current come equipped with a tire pressure monitor system (TPMS) to help monitor air pressure and alert the driver if the pressure falls 25% or more of the manufacturers recommended inflation. Discount Tire Direct recommends you refer to your owners manual or vehicle placard to find the correct tire inflation for your vehicle. Proper and Timely tire maintenance is crucial to safety. All of the tires on your vehicle should be inspected, inflated, and rotated on a routine basis. Inspect your tires every month. Inspecting your tires will help identify any damage or conditions that might impede your safety. By evaluating the remaining tread, the tire's age, and overall condition, you can eliminate preventable risks that could potentially lead to an accident. Check your air pressure every month. Inflating your tires will ensure they have the proper air pressure to sustain the weight of your vehicle. As mentioned before, an under-inflated tire highly increases the chance of tire failure. Rotate your tires every 6000-8000 miles. Rotating your tires helps prolong tread life, thus maximizing the handling, traction, and stopping capabilities of your tires. This also requires removing the tire from the vehicle which allows for a more thorough tire inspection. If you have any questions or need any assistance, one of our trusted experts will be happy to help you at 800.589.6789.